you will have a long time for this swap since it is handmade item. Make sure to send only items that you yourself would like to receive, no thrown together stuff and no simple items...Let's make an item for our partner that is respectable and has some thought and effort put into it. before you start working on your handmade item please read your partner's profile. everybody likes to receive things that makes them smile. 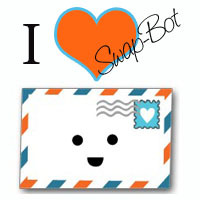 since this swap is for handmade items, only swappers with rating above 4.7 and 5 snail mail swaps completed are welcome to join. if you have 1's or 3's from the last 6 months i will ban you unless you send me a message with explanation. happy swapping! can't wait to see what you will come up with. Hi there. I am a newbie, and not so great at filling out the profile, but I did write you via flickr, as I had an account there too. I would LOVE to participate if that would be alright, and will send an extra special , over the top gift to whomever I am matched with, I promise. May I please join? I love idea,but need more practice first.Can you make another in the future? Hi principeta, if it all goes well i may host another one in the future. I would love to publish photos of everyone's finished projects on the Swap-bot blog. Please email me (rachel [at] swap-bot.com) if you would like to submit a photo. Mine is going out to Meital today. Hopefully it will be there, soon!